Funded! King of Diamonds, Finishing Info & Stretch Goal! First off I wanted to tell everyone a big huge awesome THANK YOU for an incredible first 24 hours. We are fully funded and off to the races. I have some awesome stuff planned for the project and even more things up my sleeve for the art and cards themselves. 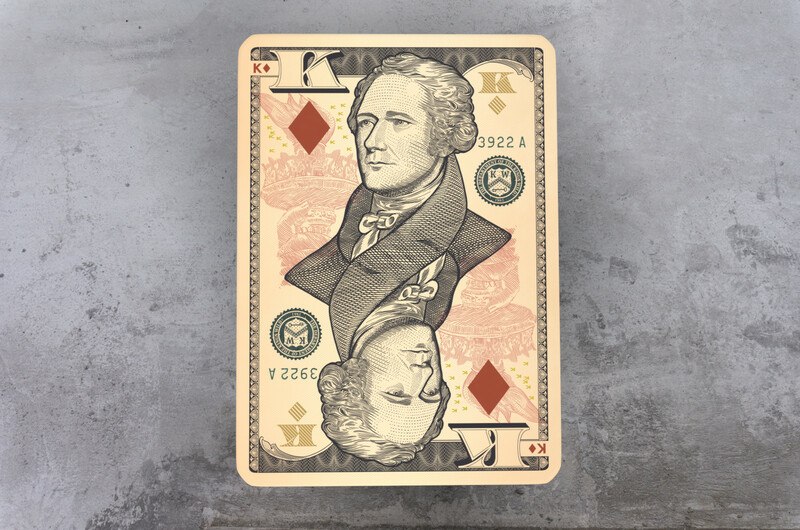 Below is the US King of Diamonds who features the design motifs of the $10 dollar bill. Finishing info & Stretch goal! A few people have been asking about the finishing info for the deck so I wanted to give a basic overview of the main points at this moment. Some of these might change, but this is the creative direction so far. I'll make sure to keep everyone posted about the progress and the plans. Thanks again for the support! Mito-chan, Richard Kempter, and 19 more people like this update. I am highly excited to see these stretch goal become a reality, I had to change my pledge from 2 decks to 4 just after hearing about it just being thought about. Amazing! Have you decided on card stock & foil? Thank you, Richard! Glad to see you're around for this project too! Congrats on funding! Hope new backers help you blast through more.